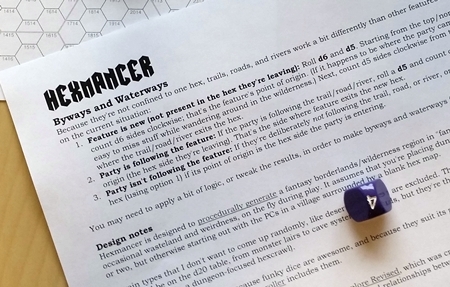 For purposes of this example, I’m not going to check for random encounters or see if the party gets lost, and I’m not going to create features if any are rolled — I’m just showing you Hexmancer. I’m also actually rolling dice — and not manipulating the results — because rolling dice is fun and I want to use this example as a proof of concept. 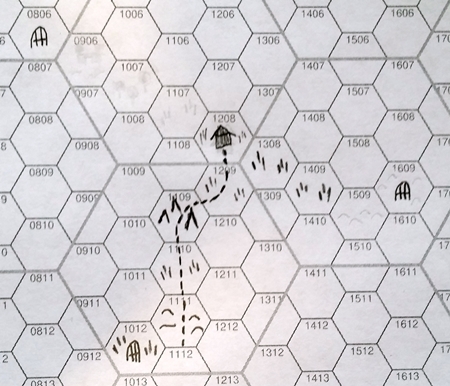 The PCs are in the village in hex 1208, which is in a borderlands region of Examplehawk. They decide to check out the rumored dungeon to the south (down). The villagers tell them the trail heads in that direction, so they follow the trail. Their origin hex is plains, so I look at the Plains column in Hexmancer. A 6 gives me plains as the terrain type for the new hex. They’re in a borderlands region, and they’re following a trail, so I check the fourth row in the d24 table (the third row is borderlands, the fourth is borderlands while on a byway/waterway). I needed a 1-4 to get a feature, and rolled a 6 — no feature. Because there’s no feature, I ignore the d20 roll. 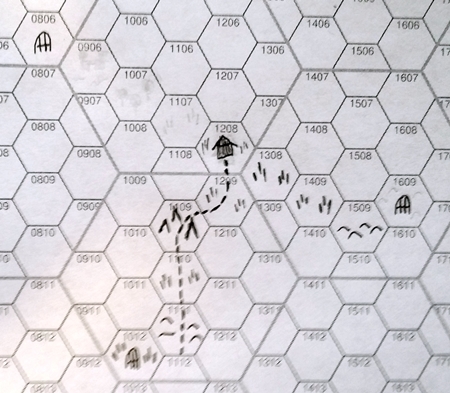 But I also know the trail continues into the new hex, so I’m going to use Byways and Waterways (Hexmancer, p. 2) to see where it leads. 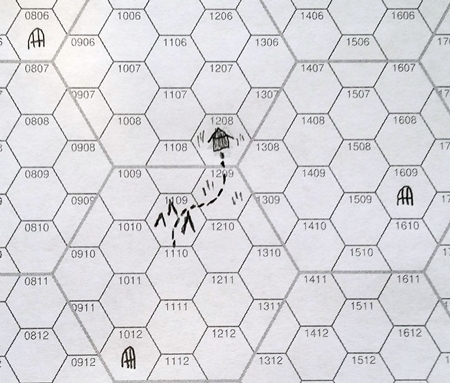 I use option 2 (“Party is following the feature”) and just roll a d5 to see where the trail exits the new hex. I rolled a 4, so I count 4 hex sides clockwise from the origin side and draw in the trail. 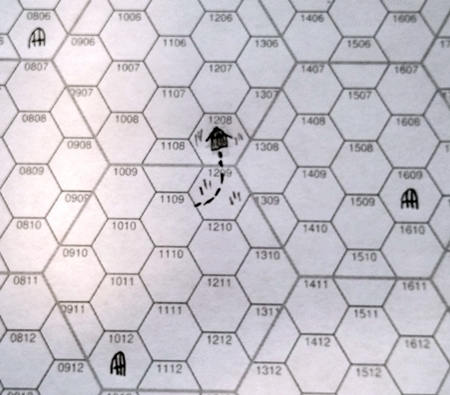 It exits into hex 1109, to the southwest. Here’s the map with my new hex added. Exiting a plains hex, a 29 gives me mountains. They’re still following the trail and we’re still in the borderlands, so a 10 on the d24 roll doesn’t generate a feature. I ignore the d20 roll again. Using option 2 in Byways and Waterways, I roll a d5 and get a 2. The trail will exit hex 1109 into hex 1110. The party presses on, following the trail through the mountains into hex 1110. Looking at the Mountains column for the d30 roll, a 29 gives me plains. No feature again, so I ignore the d20 roll and move on to the trail. I get a 3 for the trail, so it’s going to exit into hex 1111. 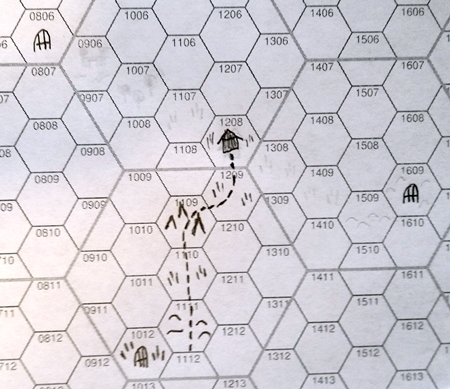 The PCs continues on into hex 1111, still following the trail. 24 on the d30 roll yields hills. 5 on the d24 comes soooo close to generating a feature (needed a 4), but doesn’t. I get a 2 for the trail, so it’ll exit into hex 1112. The party decides to leave the trail and head southwest, straight for the dungeon in hex 1012. 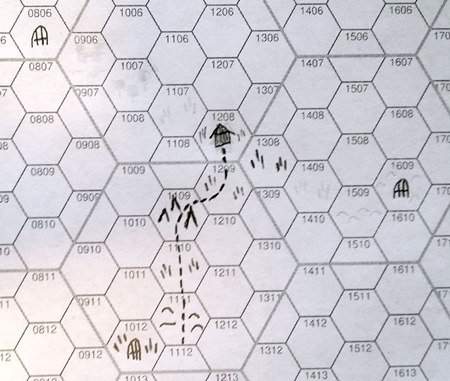 Another 24 on the d30 roll, but since the hex they’re leaving is hills I look at the Hills column: a 24 is plains. No feature, again. This time they’re not following the trail, though, so I glance at Byways and Waterways again. Option 3 (“Party isn’t following the feature”) notes that I only need to worry about the trail if its origin side connects to the hex they’re entering, which it doesn’t. The dungeon looted, the party decides to head back to the village, buy supplies, and go for the dungeon in hex 1609, to the east. 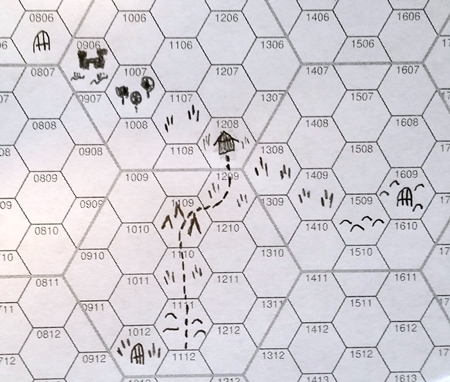 They follow “known” hexes the whole way, so I don’t need Hexmancer again until they decide to leave hex 1208, the village. 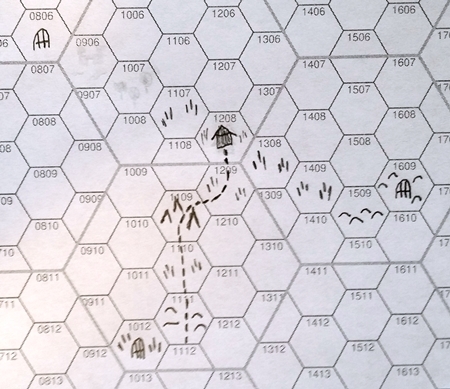 When they leave the village, there’s no trail to follow and they go straight for hex 1308. Leaving a plains hex, 15 on the Plains column makes the new hex plains as well. A 4 on the d24 roll would have generated a feature on the first four example rolls, but now they’re in borderlands and not following a trail. 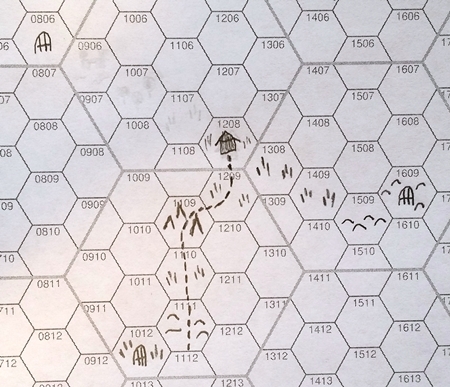 They head for hex 1409, to the southeast. That’s plains, no feature, and ignore the d20 roll. Not knowing anything else about the map, the absence of a trail leads me to decide that the PCs are now in a wilderness region. Those rolls give me hills, but no feature. Hills, no feature (other than the dungeon). The party makes it out of that dungeon, too, and returns to the village via a known route. The next Hexmancer roll will be made from the village, hex 1208, heading towards the dungeon in hex 0806. Back to borderlands, no trail, and leaving a plains hex, so that roll gets me a plains hex with no features. They head into hex 1007. 23 on the Plains column is woods; still no features. 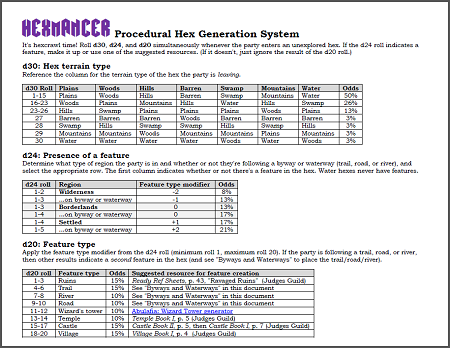 Hex 0906 has a feature! Also, the party is in wilderness again. 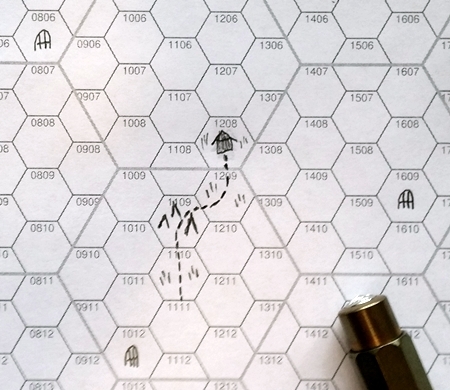 The terrain here is swamp, and a 1 on the d24 roll would be a feature in any type of region. I look at the first row on the d24 table (for wilderness, not on a byway/waterway) and see that this gives a -2 modifier to the d20 roll. With the d20 roll (19) now a 17, instead of a getting a village (the 19 result), I get a castle. Next I’d grab two Judges Guild products, Castle Book II and Castle Book I, and start rolling up a castle. 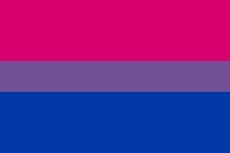 Or I could make one up, pull a pregenerated castle out of another book, use a pre-rolled Judges Guild castle, etc. At this point I assume the party would decide what to do about the castle (or vice versa! ), so I’ll stop the example here. 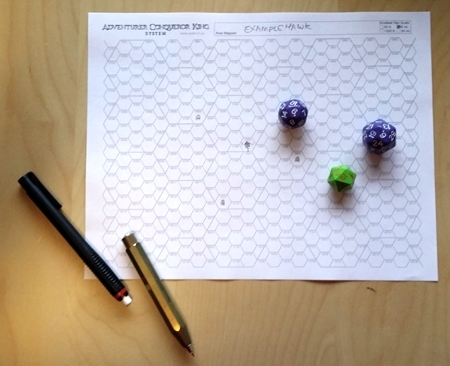 I rolled up 12 hexes using Hexmancer, including a mix of borderlands, wilderness, on-trail, and off-trail rolls. The average chance of rolling a feature across those four rows on the d24 table in Hexmancer is around 13%, or about 1 hex out of 8. Statistically, my one roll that resulted in a feature is about right. Is it “right,” though? I’m going to sleep on that, but it seems about right for the style of campaign I had in mind when I designed Hexmancer. There would also have been random encounters, at least a couple checks to see if the party got lost, and the fallout from both of those things. Features are fun, though, and the balance depends on your specific group and campaign — if you want more features, just change the d24 table. You could also seed the map with more stuff, which I’ll be doing tonight for my DCC campaign, probably to the tune of three or four villages and a similar number of features. Where does the trail to the south go? Why is there a castle next to a dungeon? I also see that the terrain in Examplehawk is pretty diverse, but not unrealistically so (at least, not for the value of realistic that I care about for gaming). 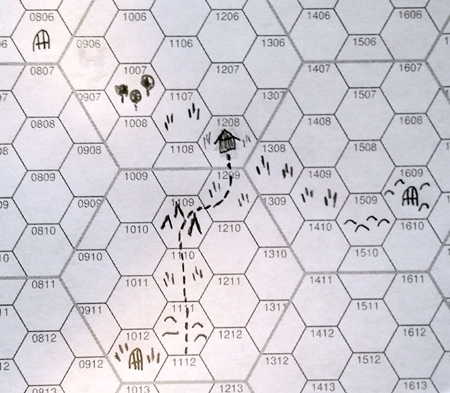 Lastly, I should note that it took me much longer to write about each hex here than it did to generate them. After a few rolls, things like “d30 roll under 16 = same terrain” became second nature, and I didn’t even have to check Hexmancer to know the results. If you have questions or feedback about Hexmancer, I’d love to hear them! 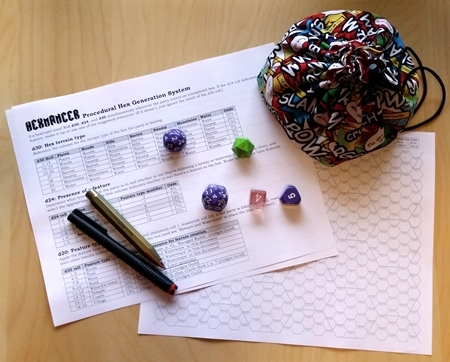 Just FYI, the link to the Hexpaper PDF links back to the Hexmancer PDF, instead. Great stuff! I just snagged a copy and added it to my hex crawl binder. I love just how direct and to the point this is. It will work great with my d100 tables I have up on my blog. 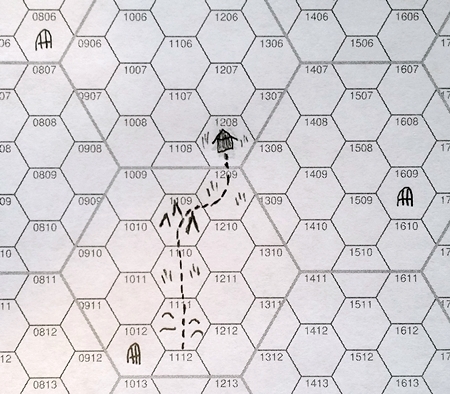 If you ever update to version 1.2, then there is a small error in the d30 Hex Terrain Type table to be fixed. In the current version, a roll of 23 breaks the table (e.g. it would result in both Woods and Hills terrain if leaving Plains). Apart from that small bug, it’s a brilliant system! Whoops, that’s a typo on my part. The correct range is 24-26 (which matches the 13% odds). Thanks for pointing it out! I don’t have MS Word anymore, so I’ll have to figure out how to move my fonts and stuff to LibreOffice before I can actually correct the typo. This is great! I imagine hex distances and movement rates can be flexible to whatever scale you need them to be? Also, how does getting lost work in this type of system? Changing the scale should work just fine. I just use the rules for getting lost from whatever I’m playing at the moment, or B/X by default. Sorry for the confusion, but how does getting lost play out on the map? “Getting lost” doesn’t really make sense as the terrain is being generated, considering the GM doesn’t even know what’s coming up next. Does getting lost simply have the effect that they didn’t move into the hex they intended to move into? Ah, gotcha. If they got lost, they might move into an existing hex or you might need to (perhaps secretly) generate a new one and not add it to the map. Once they figure out they’re lost, and get their bearings again, just update the map.